TIP “T.I.” Harris, Trae Tha Truth, Yung Booke, RaRa, Tokyo Jetz, Domani Harris and London Jae. Event Partners: Beer-N-Tacos, Chariot, D’usse Cognac. 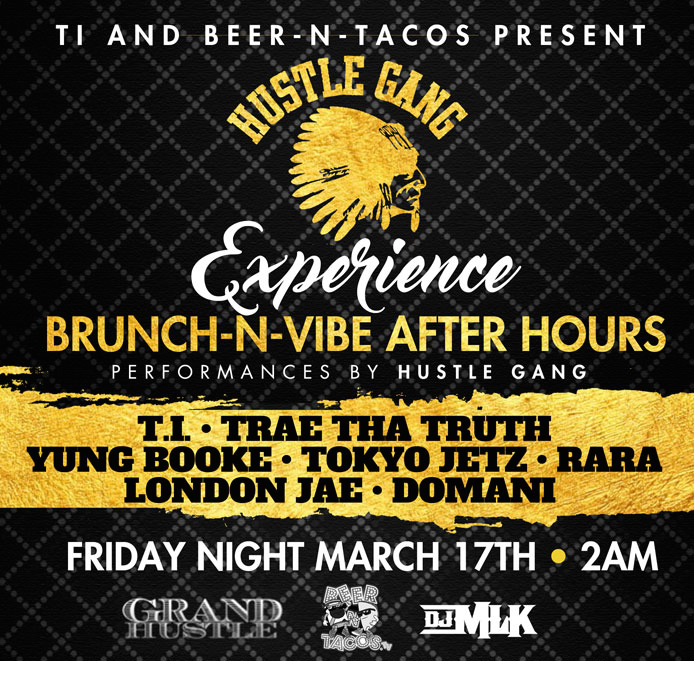 In celebration of the annual SXSW music festival, Grammy-award winning rapper, actor and Grand Hustle Records founder Tip “T.I.” Harris will present Grand Hustle‘s (aka Hustle Gang) new roster of talent at an after-hours brunch & vibe showcase. This experience will invite guests to wrap their evening of events with BBQ and drinks by D’usse Cognac, while catching vibes to live performances by Hustle Gang. Forthcoming Hustle Gang collaborative album coming Spring 2017, alongside of Tip debuting the Grand Hustle roster on the Hustle Gang Tour, kicking off April 26th in Birmingham, AL, visiting 21- U.S. cities.